Here’s what’s up in the world of television for Monday, April 14. All times are Eastern. 2 Broke Girls (CBS, 8 p.m.): “What?” you might ask, glancing at our pick for tonight’s What’s On Tonight. “Is 2 Broke Girls even still on-air?” Dear readers, it is. And tonight—tonight, we suggest you watch it. 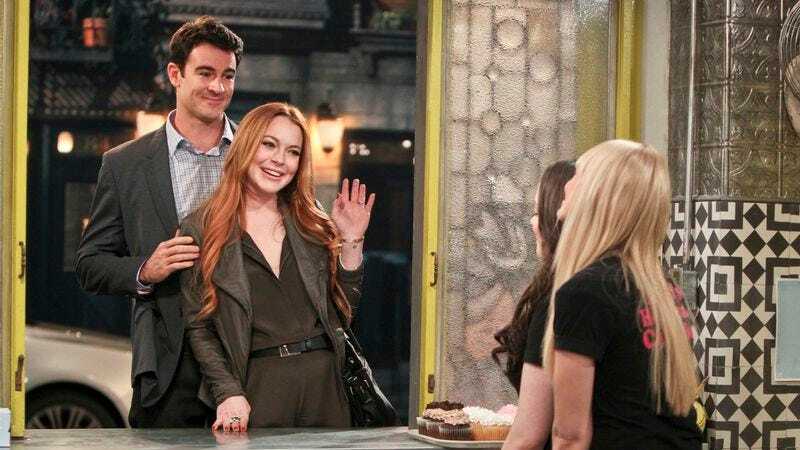 Because our Broke Girls will be joined by one very not Broke but very broken girl—Lindsay Lohan, playing a demanding bride. Trainwreck, instant comedy, or earth-shattering boredom? Tune in at 8 p.m. to find out. Sonia Saraiya is actually going to watch this and then review it, because Lindsay Lohan’s career fascinates her to no end. Regular Show (Cartoon Network, 6:30 p.m.): A special double episode tonight, telling “Skips’ Story,” parts one and two. Alasdair Wilkins would you like you to know that Regular Show airs (even) earlier now! The Following (Fox, 9 p.m.): The dreaded day is here: Todd VanDerWerff will be tackling tonight’s The Following, sight unseen, despite having seen exactly zero episodes of this season and without any sense of what’s going on! Kevin Bacon is the bad guy, right? Mom (CBS, 9:30 p.m.): And Todd VanDerWerff’s Lone Attempt To Read A Lot Into Chuck Lorre’s Shows ends one chapter tonight, as Mom closes out its first season. Goodbye, Mom. Rick And Morty (Adult Swim, 10:30 p.m.): Only Lindsay Lohan could trump the first-season finale of this show, which has wormed its way into our hearts with literal, actual, disgusting worms. Zack Handlen and the Early Birds will return right after this message from our sponsors. A full slate for you TV fans. Erik Adams takes a look at 100 Episodes of The Many Loves Of Dobie Gillis, while Will Harris interviews Good Times’ Jimmie Walker for Random Roles. Over in TV Reviews, Todd VanDerWerff takes a look at The Address, Ken Burns’ latest documentary that is a huge departure from his previous work—it’s a cinema verité look at a group of boys with learning disabilities practicing the Gettysburg Address. And Phil Dyess-Nugent looks at Syfy’s latest offering, Metal Hurlant Chronicles, and finds it lacking. Justice League Unlimited (noon): In our next adventure, some cat tries to limit the Justice League. OUTRAGE, led by Oliver Sava, ensues. Metal Hurlant Chronicles (Syfy, 8 p.m.): A whole bunch of people on a whole bunch of different planets all see the same asteroid. Some stuff happens. Series premiere! Fashion Police: The 2014 MTV Movie Awards (E!, 9 p.m.): The hit squad stages a raid on every pop star who committed a fashion crime at last night’s awards. Possession of Ed Hardy is a felony in most states. According to new research released in January 2014 by economists at the University of Maryland and Wellesley College, MTV's shows about teen pregnancy and parenthood, including 16 and Pregnant and the Teen Mom franchise, led to a 5.7 percent reduction in teen births—or about one-third of the decline in teen births since the premiere of 16 and Pregnant in June 2009. Independent Lens: Trials Of Muhammad Ali (PBS, 10 p.m): A look at Muhammad Ali’s attempt to overturn his five-year prison sentence for refusing to serve in the U.S. military. Magic Mike (HBO2, 11 p.m.): This family drama about Channing Tatum’s quest to be the best male stripper in Tampa, Florida garnered Matthew McConaughey his first Academy Award. MLB Baseball: Braves at Phillies (ESPN, 7 p.m.): So, why do you think they list it as “major league baseball baseball”? Is there some rule here we don’t know? Anyway the spring is here so here is some baseball! Game Of Thrones: Amidst all that hullaballoo about some angry men returning to TV, you might have missed a fantastic hour of Game Of Thrones: “The Lion And The Rose,” featuring the Purple Wedding. Erik Adams’ newbies review is here to guide you through the horror.